When life comes at you at high speed, who has time to make food that is fresh, nutritious and delicious? We do! At Sunflower Kitchen, we make it easy to feel good about what you are eating and feeding your family. Inspired by the earth’s bounty, Sunflower Kitchen is a family own business committed to fulfilling the promise of creating delicious, fresh, wholesome, ready to eat dishes that you deserve. Our many hummus, dips and babaghanouj offerings make healthy, energy- rich snacks that are all a great source of fiber, protein and minerals. 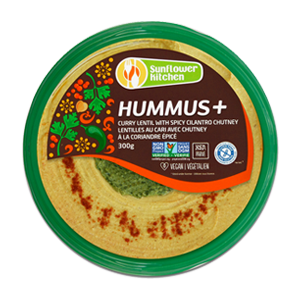 Transcend to HUMMUS+! Our exciting line of gourmet dips with irresistible toppings, bold and unique flavours for you and your family to enjoy. Our pestos are never cooked. Made with raw fresh herbs, sunflower seeds, dairy free and no nuts added. They are a delicious and simple way to get your healthy greens! 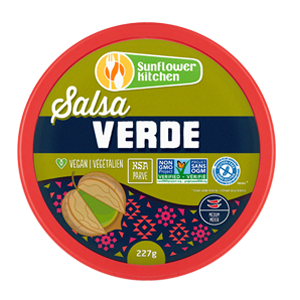 Our new FRESH SALSAS are made with quality Mexican chiles to spice all your dishes, in a whole "New Salsa dimension." All soups are packed full of wholesome vegetables, beans and whole grains and are low in fat and high in fiber. Healthy never tasted so good! Our Organic Chilis are a meal on their own! 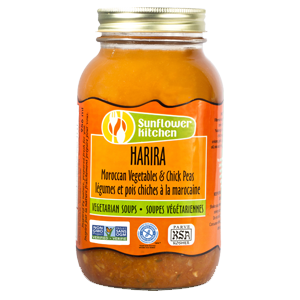 A combination of ORGANIC wholesome ingredients, that are HIGH IN FIBER, medium in spice and VEGAN. Good morning, I had to send you this note: your hummus is the best commercially bought hummus I have found to date in Toronto. The first time I bought it I ate the whole thing in one sitting, licking the last bit from the container. I love the ingredient list. I absolutely loved your garlic and onion hummus….the best I've ever had. Just had to tell you that I bought your product in West Vanc., B.C. last week and ate all of it in one go with a few friends last Friday! It was good! 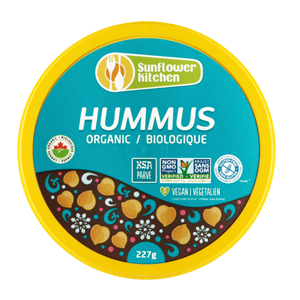 In fact, I think it was the best hummus I've ever tasted. There is a citrus 'tweak' to it that makes it very light and tasty. Your hummus is THE BEST!!!! It is far, far better than any other brand available in Toronto. Just wanted to tell you that your soups are DELICIOUS! I love them, especially your Harira and Tuscan ,they taste like they were made in mom's kitchen, not my mom's , ha ha, but someone's mom's, seriously, when I eat your soup I feel good knowing I have eaten healthy, and still enjoyed the flavour. 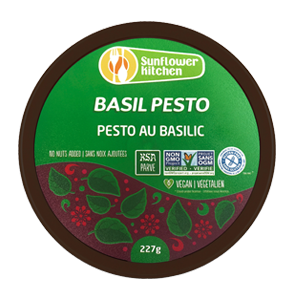 My fridge always has some basic essentials; the Sunflower Kitchen basil pesto in one of them. Just want to let you know you guys make THE BEST hummus and dips that I've ever had pre-packaged and ready to go! Thank you for having the awareness to use good quality ingredients and not resorting to canola oil. You guys ROCK !!!! It is a pleasure to enjoy the Sunflower Kitchen food because I trust they are made with first class ingredients. They complement my family meals in a natural and healthy way. I love the Pestos, Potato and Leek Soup and all the different Hummus./blockquote> - J.K. Your Soups are outstanding, as good as my own! After trying others, your brand is the best! This delicious kale pesto dip is a must have at the cottage or summer BBQ's. With high quality, fresh ingredients...you know you are serving something that is both healthy and appetizing! Sunflower Kitchen is a family owned business committed to fulfilling the promise of creating delicious, wholesome, ready to eat dishes for you and your familiy.